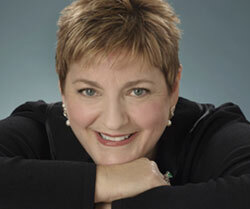 Soprano Sally Wolf began Seattle Opera career as Gilda in the 1988 production of Rigoletto, and she's returned a dozen times since then, becoming an audience and company favorite in the process. In The Barber of Seville, which opens this Saturday, Wolf will be taking on the role of Berta, Dr. Bartolo's maid. She recently sat down and talked with us about the shift from starring to supporting roles, her passion for teaching, and what she'd love to sing—if only she were a baritone. In your career at Seattle Opera, you’ve had a wide range of roles, both front-and-center (Norma, Lucia) and supporting (like Berta in Barber). Do you enjoy that sort of variety? I love the variety. When I was in undergrad, I did a lot of Gilbert and Sullivan summer stock. So I did comedy, and then when my career started, I did a lot of Queen of the Night and Donna Anna, and other "serious" things. But this is my thirty-second year of singing, and I’m not getting the ingénue parts anymore. That’s fine—I love doing the character roles. 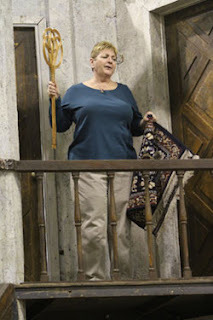 Alice Ford in Falstaff was fantastic, and this is my third production of Berta, and I enjoy doing it. Most of my career, it’s been the larger roles. And then people started asking me to do other things and I thought, "Yeah, this is fun." And that’s the way things go, with the aging. Do you have any role in Seattle you’ve particularly enjoyed? People ask me all the time, "What’s your favorite place to sing?" And I say Seattle, and they go, "Seattle?" They expect you to say the Met or Covent Garden or something—and those places are really great—but I love this place because of the people and the work that they do. So I’d have to say just about everything I’ve done here I’ve loved. But one highlight is I got to sing Norma here [in 2003] and Kevin Langan, my husband, got to play my father. That was kind of special. Also it was the first time I’d ever worked with Edoardo Müller, and I’d seen him with Kevin in other places and I’d always thought that I’d love to work him. Another highlight is the first time I worked with Peter Kazaras, who is directing this Barber, when I sang Magic Flute with him here in the 87/88 season. Sally Wolf, in rehearsal for The Barber of Seville. In addition to performing, you also teach. How long have you been teaching? This is my tenth year, and I’ve been teaching with Westminster Choir College in Princeton, NJ. I’m what they call an adjunct, I’m part-time, but what’s great is that they knew coming in that I would still be doing some performing. For this job right now, it’s over our Christmas break so I’m only going to miss one week. But when it’s in the middle of the year—say I’m here in February for six weeks—then I’d have my husband or someone else come in and teach for me, and then I’d go back and make up the lessons. But they’ve been really good about that, because they knew I was still going to perform. And I’m not performing as much anymore, so it fits in and I can pick and choose what I want to do. What is it that you like so much about working with students? I run the gamut of freshmen to graduate students to emerging professionals, and with this situation, I’m seeing all different categories of singers. I’m seeing beginners, and I’m also seeing people who are a little more polished—and I love being able to help people realize their potential. Also, I also feel that we as singers basically end up teaching ourselves. Our teachers give us the ideas but then we go to the practice room and do the work of figuring it out. And you want to make sure that the ideas and the technical things that you give your students, that they can interpret that and take that along with them so they can teach themselves. I feel so blessed that I’ve been able to do what I love to do and make a living, and I feel blessed and thankful that I can help someone else reach that. 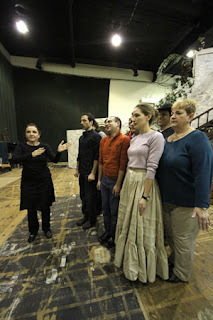 The Sunday/Friday cast works with choreographer Rosa Mercedes. 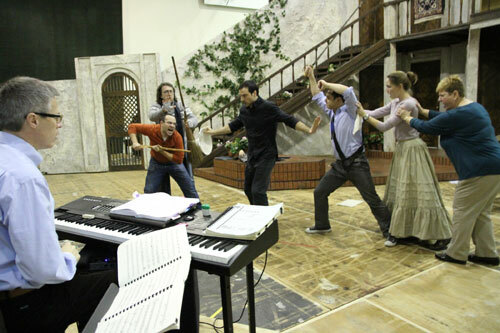 From left to right: Mercedes, David Adam Moore (Figaro), Patrick Carfizzi (Bartolo), Kate Lindsey (Rosina), Adrian Rosas (Sergeant), and Sally Wolf (Berta). They say that bel canto operas like Barber demand and cause "healthy singing." As a teacher, do you find that to be the case? My opinion is that everybody has their own voice. So whether I’m singing Bach or I’m singing Verdi, I’m singing with my voice and my technique. I think that some things—especially Mozart—are written perfectly for the voice. But I’m a big fan of telling my students that you sing with your voice, and some music is not appropriate for one but is more appropriate for another. We as teachers, and as singers, need to know that. I know some people think, "Oh now I’ve got to do this or that because I’m singing Bach, and my voice is different when I go to this." And I’ve never felt that way. I just use my voice. If something needs a lighter touch, then I’ll sing softer, or whatever, but I’ll never make my voice something that it isn’t. A big example is people who do roles that are larger than what they should be doing, and then they have to push their voice and make it get over the orchestra. There are certain pieces of music that people don’t do. I would never do Brünnhilde. You kind of know what music you can do and do well with your voice. Has there ever been a role you wished you could have done, but you didn't think was suitable for your voice? But I guess I would’ve liked to have done Trovatore, because after my high coloratura days, that could’ve been one I could’ve done. But I’ve done so many great roles that I don’t feel like I’ve missed anything. I’ve loved all the roles I’ve done. I’ve been so fortunate to love the music that I sing. It would be terrible if you hate what you do! Going back to The Barber of Seville, can you tell us about your character, Berta? What is her place in this opera? Well, I love this production because when I’ve done Berta before, it’s kind of like she’s this comical character that comes in and takes care of Bartolo and does his laundry and all of that, and she doesn’t really know what’s going on. She doesn’t know what’s going on behind the scenes. But I love the way Peter Kazaras has brought Berta into it here. She knows what’s going on—the whole household knows. I don’t think she knows at the beginning that it’s the Count, but she knows it’s the person that Rosina has seen and has fallen in love with. The Sunday/Friday cast get animated in rehearsal. From left to right: Conductor Dean Williamson, Patrick Carfizzi (Bartolo), Burak Bilgili (Don Basilio), David Adam Moore (Figaro), Nicholas Phan (Almaviva), Kate Lindsey (Rosina), and Sally Wolf (Berta). Do you have a favorite moment in Barber? I love the aria that’s not usually done by the Count, and Larry’s doing it this time. I love that. I just think it’s such an exquisite moment for the tenor. But in Barber, it’s the whole thing that comes together—there’s not just one highlight. It’s the beginning to the end that’s so much fun. We have these young singers that are so incredible—just beautiful—in both casts, and Peter makes it fun and Dean Williamson makes it fun. It’s a great time, and I hope the audience thinks so, too.